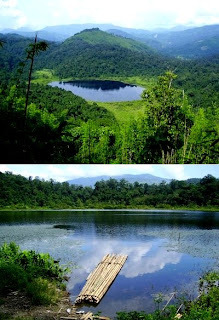 Palak Lake (Pala Tipo, Palak Dil)- is one of the biggest natural lakes of Mizoram & falls in the Chhimtuipui district. The local people believe that the lake was created as a result of an earthquake & a village which was submerged still remains intact deep under the waters. Palak Lake is a natural lake. Bordered by deciduous & tropical evergreen forests, this Lake in Mizoram is one of the most beautiful lakes of the state. The Lake is of ovate shaped and has a width of 150 meters and a length of almost 200 meters. It is completely unpolluted and water is considered to be completely free from dirt and impurities. The Lake is situated within the Mara Autonomous district Council, which is a region inhabited by the Mara Tribe. The lake has a baleful reputation of being a place haunted by ghosts and evil spirits. The lake also has many myths and legends attached to its origin. This is the only abode of aquatic birds. With wild duck of different species all around, Palak Lake is a paradise for bird-watchers. The serene ambiance, the crystal clear water and the presence of rich flora around the lake attract many local and migratory birds throughout the year. So far more than 70 species of birds have been recorded in the adjoining areas of Palak Lake. It would be great if you can tell us how to visit the places and is it safe for tourists. People that really respond to it are the ones who move here from out of town. They're really amazed by the facilities that we have. And when our kids travel out of town, they're always really amazed with how nice our facilities are compared to others.